Home Resources 25th Anniversary Gifts: It’s More Than Just A Celebration! Your 25th anniversary gifts can either be exciting celebrations or bland and boring gestures that feel like nothing more than an obligation. Every married person understands the importance of anniversaries. Over the years, however, even the most devoted couples can become numb to the excitement of these special events. Milestone anniversaries can be opportunities to dazzle or disappoint your significant other. While an anniversary should involve more than gifting, a memorable present can show your loved one that you appreciate them. Flowers from the grocery store may be pretty, but they can seem uninspired as a gift idea by themselves. If you want to make an impression that lasts far beyond your anniversary date, look for gifts that do more than just check a box off a list. Put some thought into your partner's likes and interests, and use your 25th anniversary as a date to not only to celebrate the past but also to shine a path to more love and joy in the future. That may sound like a tall order for an anniversary gift, but truly memorable 25th anniversary gifts are everywhere. A 25th anniversary is an impressive occasion. For many couples, it is difficult to develop a relationship that can endure beyond two decades. For many couples, the passion and energy that spark a relationship may fade fairly quickly. Some say this original blast of emotions and attraction dwindles after 15 months, and some say this "love" only lasts a few years. However, there is a crucial difference between new relationship attraction and the kind of dynamic that powers a long-lasting relationship. The most successful and long-term relationships result from mutual respect, comfort, reassurance, and connection. Your 25th anniversary gifts can go beyond just providing a trinket to showcasing some of these essential elements of a long-term relationship. Thoughtful gifts can be traditional ones. The key is to identify a present that reinforces respect and connection by speaking to an interest or desire. Beyond flowers and candy, 25th anniversary gifts have some connection to tradition. The 25th anniversary is also referred to as a "silver jubilee." This is also the name given the 25th anniversary of any momentous event. As such, there is often a connection between silver and celebrating 25 years. Silver is a nice gift, but on its own, the precious metal doesn't shine greater than the heart behind these unique gift ideas. The best gift ideas come from the heart, but even the most romantic presents often require some inspiration. We've collected our favorite 25th anniversary gifts. These items range from artwork to jewelry, from simple to complex. We're confident that there is a gift on this list that every couple will appreciate. Few things represent the beauty of an enduring relationship like a custom piece of artwork. The IPIC Heart in Heart personalized photo depicts a stunning oceanfront sunrise. In the brightly colored picture, frothy lapping water approaches your custom sand-scrawled names in overlapping hearts. Under the names in smaller sand scribble, is your celebrated date. Printed on 100 percent cotton canvas and stretched and wrapped on a wooden frame, this picture comes ready to hang. For protection, IPIC coats the print in semi-gloss acrylic. This step extends its lifetime, reduces the accumulation of dirt and dust, and keeps the colors from fading. This print is the perfect 25th anniversary gift for those who enjoy nature or ocean vacations, and especially those who met or married on the seashore. 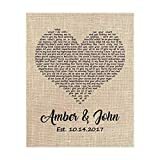 It will make a bold statement of love and connection in your home, serving as a frequent reminder of the strength of your relationship. It comes in several sizes, including different framing material choices beyond the stretched canvas over wood frame. For a different spin on anniversary artwork, check out the folded book art by Boston Creative. This handmade gift is perfect for a spouse or partner who loves reading, art, crafts, and reminders of special days. Each of these items is handmade with a labor-intensive process that results in a truly unique item. The artist transforms a new hardcover book by folding its pages into a pattern that displays an anniversary date. The resulting artwork is one of the most interesting 25th anniversary gifts on the market. With this folded book art, your special day shines in 3-D, jumping out of the opened book for all to see. With this book sculpture, you can choose up to six numbers, which is ideal for an anniversary date. You don't need to worry about durability with this gift. The artist uses a new hardcover book, unlike some other versions that upcycle old books. While an upcycled book might have some additional character, the older pages are prone to yellowing and, depending on the age of the used book, can be brittle. By using new books, your artwork benefits from modern publishing methods and stronger paper. Some of the best 25th anniversary gifts are unique jewelry pieces that can be enjoyed by each partner. Even for a 25th anniversary, jewelry doesn't need to be pricey in order to be appreciated. The His & Hers matching titanium stainless steel couple pendant uses a modern-looking concentric-ring design to display enduring love. Now, name aside, this is not titanium jewelry. It boasts a titanium finish to its stainless steel construction. Using laser cutting and polishing, the company creates an eye-catching, sleek look. Four small cubic zirconia stones add some sparkle. One pendant has a 22-inch chain, while the other has a 24-inch chain, so the matching gifts are perfect for any couple. SunnyHouse Jewelry calls these pendants "Korean-style." They are light and comfortable to wear and make for a nice couples gift. 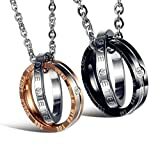 The rings on the pendants contain two inscriptions: "Eternal Love" and "The World Looks Wonderful When I am With You." What a wonderful, simple, and inexpensive way to celebrate your enduring relationship! The gift also comes in a gift box with a "lucky bean." Some spouses or partners do not like jewelry or may have accumulated too much jewelry over the last 25 years. However, other gifts provide the dazzle of precious metal without being intended as accessories. 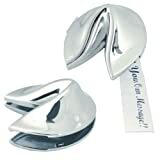 The Silver Fortune Cookie from Natico is a cute product that is sure to delight many as an anniversary gift. This hinged silver-finished decoration has a space for a custom anniversary message, just like a real, edible fortune cookie. This item would look great as a paperweight for someone's office, or as a decorative element on a mantle, shelf, or other areas in the home. This memento is small and lightweight at only 4 ounces and about 3 inches by 2 inches. Unlike a custom, edible fortune cookie, this decorative piece will be around for another 25 years or more. You can create your own message or enter custom message information when you order. The cookie can hold other small items, too, such as a love note or a favorite poem. Do you remember your wedding song? We are sure that your partner does. Wedding songs can signify much to a married couple. A song might spark memories of life 25 years ago when your love was young, and the future seemed limitless. Sometimes wedding songs are grabbed from the popular song charts of the day or are traditional songs. Either way, even when a couple's musical tastes change, the simple message of love endures. A cool way to recapture that song from 25 years ago is to turn its lyrics into a custom piece of art. The Wedding Song Lyric wall art from LetteredWhimsy displays those words of love in a heart shape. Below the heart, you can add names and the anniversary date. As one of the most unique 25th anniversary gifts, this artwork can transport a couple back to their celebrated day each time they lay eyes on the lyrics. This artwork is hand-cut from burlap, cotton, or linen. The artisan then uses archival-quality ink for sharp, clean images that will last for many more anniversaries to come. The piece comes delivered in a protective roll; you add a frame to protect and prolong the lyrics. The problem with many anniversary gifts is how they are either costly, such as a gold watch or diamond bracelet, or they are disposable, such as flowers. Even an expensive anniversary gift might not get used that often. Rather than celebrate an iconic anniversary with something that will be gone in a week or will spend most of its life in a jewelry box, look for a gift that can be used nearly every day. A personalized cutting board is a gift that you will see or use all the time. If your partner enjoys cooking, or if you both like to entertain, displaying your name and your special day on a cutting board is a nice way to remember a wedding. NakedWoodWorks makes several custom cutting board products. We like their personalized cutting board as a serving platter for cheeses or meats for those who entertain. Although you can use the cutting board for hacking up onions, you'll likely chip away at your special message. The board comes in maple or walnut, with an oiled finish for longevity. The company cuts, glues, and sands each product by hand in Oklahoma. Once engraved, the boards are re-sanded for smoothness and re-conditioned with food-safe wood oil. What if the most ideal of all the 25th anniversary gifts wasn't a piece of jewelry or home decoration, but rather was a springboard for experiences? Some of the best gifts are adventures. Trips, new activities, and other fun experiences help continue to build upon the strengths of your relationship. With "Our Bucket List: A Creative and Inspirational Journal for Ideas and Adventures for Couples," you and your significant other can compile dreams and get to work marking off their achievement. This simple book encourages activity, which many relationship experts note as the key ingredient in successful marriages. Get off the couch, open up this book, and start planning for another 25 years of fun. You'll love exploring new things and fortifying your already-strong bond. The book works in many ways, like a project management tool. This is unsurprising once you realize that goals aren't often accomplished through wishful thinking. They require work, but the effort does not have to be tedious. Planning can be part of the fun. This book lays out blank spaces for dreaming, like a guided journal. The prompts are simple. You and your partner enter an idea, then answer two important questions: Why you want to do the activity, and what you need to do to make it a reality. Then there is a ton of space to enter the details of your experience together. This is the cheapest gift on our list, but it may be the most precious. Our final entry in our list of 25th anniversary gifts is one for those who often have to spend time apart. Over 25 years, the words "I love you" can start to lose weight even in the strongest of relationships. The words can mean less over time. Then, actions become more important. This is why experts emphasize activities and togetherness as important elements to strong relationships. However, if one of you travels for work or there are other reasons why you must spend some time away, words can fill the void that loneliness creates. The Engraved Aluminum Wallet love note is an almost old-fashioned gift. It screams "I love you" in a way that those words cannot express over a phone call. It's a simple gift, but it is one that will capture the hearts of a loving couple. The card is wallet-sized and contains a pre-written statement about love and an endearing message that "wherever you are, a piece of me will always be with you." The manufacturer also offers a customizable version so that you can add your own touch to this heartwarming product. Choosing your 25th anniversary gifts are tricky; it's a benchmark year for nearly all couples. However, the best ones are not necessarily the most expensive. If you have the means, and your partner adores pricy gifts, by all means, lavish your love. For those who want to make a unique and resonant statement for their 25th anniversary, think about gifts that carry deep meaning. Whether it is a piece of artwork to serve as a daily reminder of the origins of your love, or an ambitious to-do list, 25th anniversary gifts don't have to be expensive or boring.